Jane and her son looked through multiple ideas online to determine what to make for his school Valentine's. After much contemplation, Cam decided he wanted to create the bookmarks, for the third year. He chose the colors and the quotes. The two that made the final print? 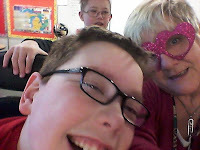 At school, Cam gave his teacher some funny glasses and the day was filled with different activities celebrating friendship. Our Valentine's day began with heart-shaped waffles and ended with heart-shaped pizza and breadsticks, compliments of Jet's Pizza. Our family decided it would become our new tradition for Feb. 14th. Jane surprised her boys with some musical cards and small gifts. Chris and Cam presented Jane with a gorgeous bouquet of roses. Of course, Cam's dad brought one rose in first and then proceeded to deliver the large arrangement. 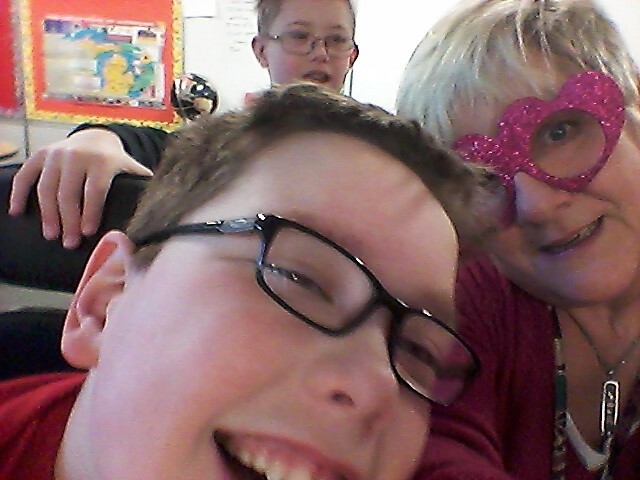 Our loving boy also received V-day cards from Oma and Opa, Auntie Karen and Auntie Jo and Will. An abundance of sunshine filled the weekend. Our family fired up the grill with the Raisch fam Saturday evening and dined on hamburgers with all of the fixings! Oma and Opa arrived Sunday afternoon to spend the night with us. Due to the unusually warm temps, we decided it was a good idea for us all to partake in some delicious Culver's milkshakes. Perfect timing since Cam and his dad were working outside building a new workshop bench for Chris. Look at that sawdust fly! Jane often tells Cam he takes after his father in more ways than one. Although we've never heard Chris talk about increasing the temp of his heart, it's nice to know his son shares his gift of injecting love into a simple phrase. "I like you too, Cam." "Thank you, Mom...that warms my heart."